The last of the Su-35s that China is purchasing from Russia will be delivered this year, according to a Russian state-owned corporation. During the St. Petersburg International Economic Forum from May 24–26, Rostec, a state-owned company, announced that the last ten Su-35s would be delivered to China in 2018, according to reports in Russian media. Rostect was the entity that officially signed the agreement for the fighter jets with the Chinese government. Beijing became the first foreign country to purchase the Su-35 when it agreed to pay $2.5 billion for twenty-four planes in November 2015. As the National Interest has previously noted, China received the first four planes from Russia in late 2016 before getting another ten Su-35s last year. Beijing formally inducted the Su-35s into service in April of this year. “The People’s Liberation Army (PLA) has commissioned Su-35 fighter jets,” a spokesperson for China’s Ministry of Defense said at the time. “As a multi-role fighter jet, the Su-35 is capable of precision strikes on ground and sea targets.” Even before then, in February 2018, China’s Su-35s took part in air combat drills over the South China Sea. According to media outlets, this was the first time Beijing had sent the planes on a public deployment. The Su-35 is Russia’s most advanced fighter jet, and is often referred to as a 4++ generation fighter. 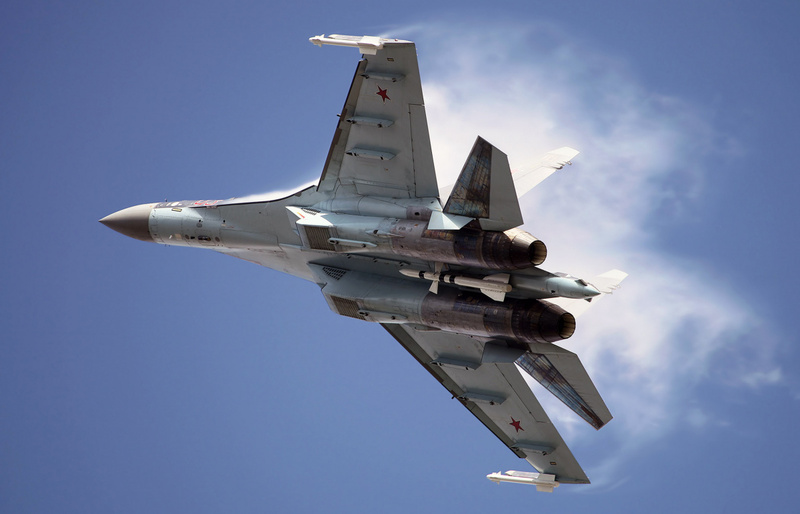 While based off of the Su-27, the Su-35 offers a number of significant improvements, including high maneuverability as well as advanced electronics. RT, the Russian-stated owned media outlet, has said that the plane is able to detect, track, and engage multiple targets at long ranges because it is equipped with a phased array antenna radar. The same source says each plane has an internal thirty millimeter cannon and twelve hardpoints capable of carrying eight thousand kilograms of missiles and bombs. The Su-35 also has a maximum speed of 2,500 kilometers per hour and a range of 3,400 kilometers (combat radius of 1,600 km). This range and the Su-35’s high fuel capacity is perhaps of most interest to China as it greatly enhances Beijing’s ability to enforce its claims in the South China Sea. China claims roughly 90 percent of the South China Sea, various parts of which are also claimed by Brunei, Malaysia, Indonesia, the Philippines, Vietnam, as well as Taiwan. It is an extreme challenge for Beijing to maintain a regular presence over the enormous waters, which are roughly 1.4 million square miles (2.25 million square kilometers). This can be mitigated by the construction of bases and airstrips on Beijing’s man-made islands in the South China Sea. Just last month Beijing landed H-6K bombers on Woody Island (a non-artificial island) in the Paracel Islands. One important improvement of the Su-35 over the Su-27/J-11B is the ability to carry external fuel tanks . . . a major factor limiting the Su-27, which does not have aerial refueling capability. This is in addition to a 20 percent increase in fuel capacity over the Su-27 and air refueling capability. This later capability is another important part of China’s strategy of increasing loiter times and distances. Although China is the first foreign customer of the Su-35, negotiations between Beijing and Moscow over the Su-35 were fairly prolonged. China first expressed interest in purchasing the jets in 2006, and Beijing and Moscow spent the better part of five years trying to reach an agreement. In 2012, the two sides signed a preliminary agreement but talks continued to encounter obstacles. Most of these roadblocks related to technology transfers and Russia’s concerns that Beijing would reverse engineer the plane. This is what occured when Russia agreed to sell China two hundred Su-27SKs for $2.5 billion. Later, China debuted its own version of the Su-27 called the J-11B. Russia ended up cancelling part of that contract in protest of the J-11B.